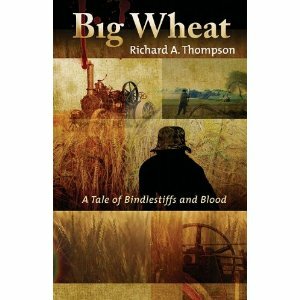 Seldom have I read a mystery novel more in the moment than Richard Thompson’s Big Wheat. It’s the summer of 1919, and heartbroken by lover Mabel who has cast him off, twenty-three year old North Dakota farm hand Charlie Kreuger pins his abusive father to the kitchen table with a carving knife and hits the road to seek his fortune. Unfortunately, Mabel has become one of the long string of victims left behind by the Windmill Man, one of the creepier villains of recent crime fiction, and Charlie’s disappearance in conjunction with Mabel’s has led local law enforcement to believe Charlie killed her and ran away. The sheriff is after him and so is the Windmill Man, who is afraid Charlie can identify him. But Charlie makes plenty of friends along the way, too, including George Ravenwing, a chance-met Lakota Indian who may or may not be corporeal, Avery, the paterfamilias of the Ark (just read it) who gives Charlie his heart’s desire, a job on a steam engine, and Emily, the feisty Brit who becomes his new love. 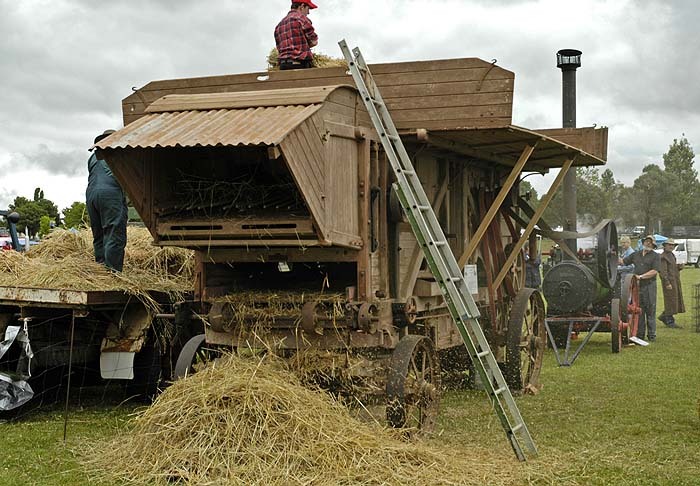 Just for fun, found this photo of a belt-driven threshing machine, circa the time of Big Wheat, on lookANDsee. Talk about setting a scene. This is not what we in the business call an expository lump, a gigantic dump of information left for the narrative to stub its toe on. No, this is a master hand coloring a character in all the way to the edges, while at the same time firmly fixing his novel in place and time, with the reader barely noticing. That, folks, is craftsmanship. Solid plot, a villain who gets more out of control and more terrifying with every turn of the page, good dialogue, wonderful description of land and weather, and great characters combine to make this a really good read. Here’s me, selling Big Wheat to the crowd at the Juneau Public Library on February 4th.